New item for 2003. This is the smallest version of our hatchers. 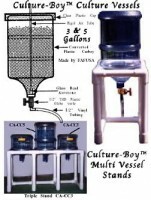 Our mini hatcher is designed for those who have little room and/or a low demand for live brine shrimp, rotifers or microalgae. Comes with a 400 ml (13.5 oz.) hatching tube with an attached stand, bottom drain valve, airline valve, rigid air tube and cap. Height 12” and width 4” x 4”. Neat and very compact.